Fangirls, like many women out there, I have a monthly period. Once a month, my uterus sheds, and it can be frustrating. I don’t get grumpy, I just get hungry and horny and zitty. It’s not a fun time. Luckily, there’s a rad company called Madame Ladybug who has made it their mission to make women’s periods something they look forward to, instead of dreading. 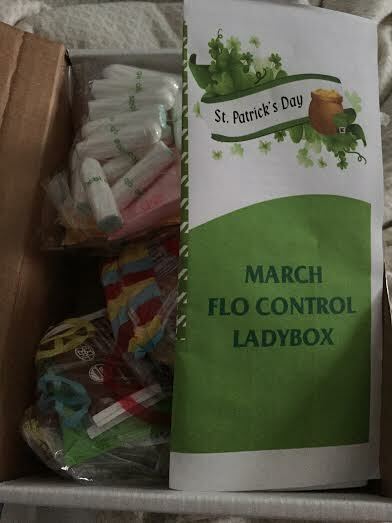 I did a one month subscription to the Flo Control box (the least expensive), which means they charge me once, and I get one box. Their service doesn’t automatically renew, so if I want to do it again, I have to go to their site and log in to request another box. If you know how fantastic Ladyboxes are, you can subscribe to a 3 month selection of boxes. There are several options for the boxes, but I went with the least expensive, because my period is pretty tolerable. But for women who need something stronger, there are options. For $15 plus shipping, that’s fantastic! The necklace alone is listed as $23, so you’re getting more than your money’s worth. The only thing I didn’t want was the Rice Krispy Treat, and that’s only because I don’t eat gelatin. I was really excited to see that the fruit snacks were gelatin free, because I haven’t eaten fruit snacks in ages, due to the gelatin. And you know what’s great about Madame Ladybug Ladyboxes (other than everything)? They get to your house the week before your period. That way, you’ve got your tea and snacks for the week before, if you have PMS problems. Since I get snacky, especially at school, I just tossed the snacks into my bag before class this past Tuesday (which is my longest day of classes), and that really helped me out. Overall, Madame Ladybug’s Ladyboxes are incredibly awesome, and I highly recommend them to everyone! The stuff I got made it so I didn’t have to go out to buy feminine products, and since everyone gets to pick out their preferred brands and sizes, the box was made for me! So go, Fangirls, check out Madame Ladybox, and fall in love!